Individual European Championships in 2013 gained a new quality. Instead of a one-day final, the best of riders of Europe will be fighting for the title, medals and prize money in a series of four final tournaments. And all this can be followed live on Eurosport. 2014 belonged to Emil Sajfutdinow. This way Russian finished the mission which he started the season before. Then after two wins in two tournaments he was main candidate to the final win. Unfortunately he got seriously injured which caused that he ended the season. Last season Sajfutdinow finished the mission which he started the year before. The gold medal of European Championship he dedicated his death father and in the next series he would like to defend the title and write his name again on the cards of European Championship history. 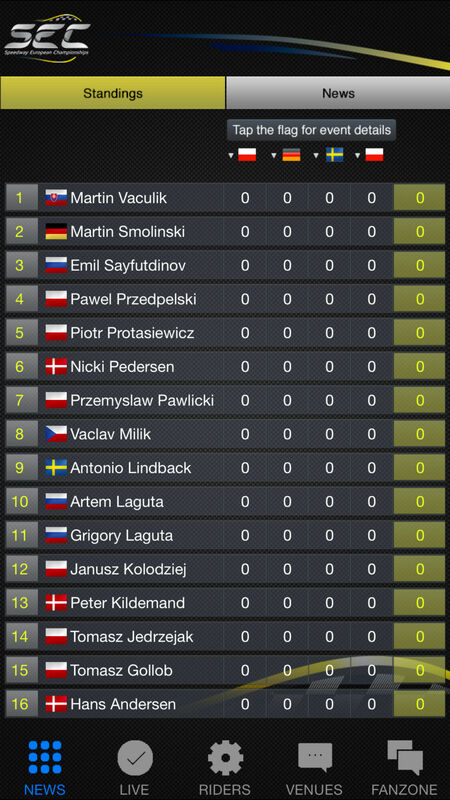 Emil Sajfutdinow, Peter Kildemand, Nicki Pedersen, Martin Vaculik and Janusz Kołodziej won the qualification to SEC 2015. We are waiting for your comments, reviews, suggestions.